When my first book came out, Katz Tales, Living Under The Velvet Paw, I gave 10% of my take to Friends Furry Farm. It wasn't much, as I only got 10% myself. When I decided to try out e-books, I decided to spend all of it on spaying and vaccinating strays. As I've said before, I'm not a rescuer but I do feed the 6 or so poor souls dumped on our back doorstep twice a day. So far it's been out of my budget to do much more for them. The 3 Katz Tales e-books have so far netted US$38.72 of which I get to keep about 70%. I'm getting my first cheque at the end of this month, and although it covers about 50% of what I need for a spay and vaccination deal, I thought I'd go for it. Thanks to all of you who have helped me so far by buying the books and promoting them! Yesterday this stray girl (I call her Tabby. Inspired, huh?) was spayed and given an anti-mite injection - the mite treatment was free. Next week she gets her second dose of mite stuff and her first vaccination. We spayed first as pregnancy is our top concern and there is currently no rampant disease in our area. Crossed fingers. 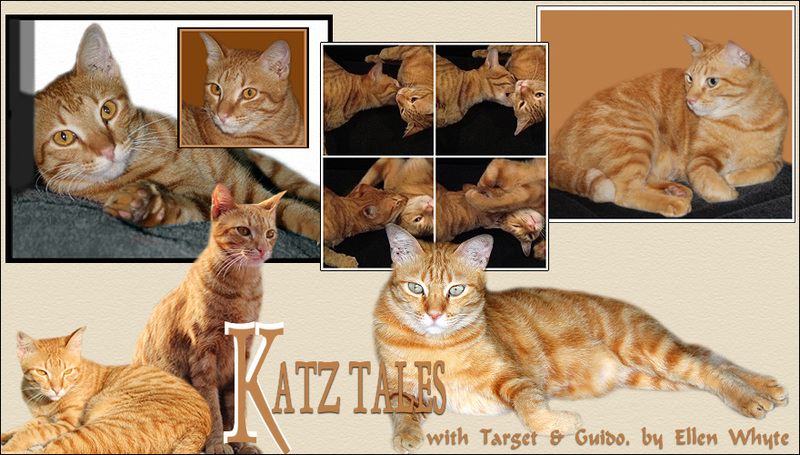 Visit Smashwords, download the free Katz Tales ebook and review it. If I get lots of good reviews, my books go to the top of the list. 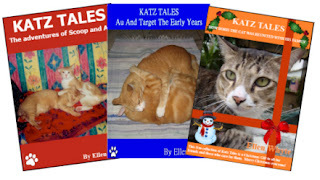 Buy and review Katz Tales Au And Target The Early Years and Katz Tales The Adventures Of Scoop and Au from Smashwords or Barnes and Noble or look for them on iTunes. Price is US$1.99 each. Please pass the word to others. You can Share the post on the Katz Tales Facebook Fan Page or leave me your email address and I'll send you an email that you can forward. And if you know anyone who wants to do an interview, please volunteer me - or better, still, Au, Target and Guido. Meow from all of us! Paws up for your efforts! You just helped make this young lady's life so much better! I am pro spaying, but sometimes it made me think about the rights of the cat to have babies and multiply. But at the same time after seeing countless kittens dying from neglect/roadkill i think spaying is a better option. This is great! Purrs and hugs to you! Om, she has my dilute colouring. Thanks for helping her and making sure she can lead a safer and healthier life! You are doing such wonderful things for your furry friends! Good luck. What a great thing to do for the kitties! That is wonderful, wonderful, wonderful! Concatulations on your efforts! We will go check out the books! Hi Ellen, my dad just purchased "Katz tales the adventures of Scoop and Au" for me. He said that he'd read me a chapter at bedtime. I like cats too. So kind of you to consider those living on the streets. We bought both for Mommy! We'll hound her to do a review. And kudos for spaying a feral! That many many many less kittens. I've purchased and given several copies of Katz Tales as gifts! I love your TNR project! I can help, once the foster kittens go to their new home. It's much more economical to get the kitties spayed at the SPCA. Concats! Here's to many, many more! Our mom successfully downloaded one book, so she is going to download the others. We gave you an award if you'd like to pick it up. We hope you don't have it already. Purrs! Amazing news! Paws up dear Ellen, and concATUlations! That's wonderful what you are doing for these poor cats ! What a wonderful thing you do for kitties! You sure make a world of difference! You are doing so much good. Thank you! Hey Au, Hey Target, Hey Guido, Jet here. I can't thank you enough for all you do for our feline friends. We need more people like you! After work I will visit Smashwords for my review. Hugs to Au, Target and Guido and a big one for yourself. Big (((purrs))) to you all! I didn't realize that this was what you are doing. I sure want to help you. If I don't have any of those iPads, Nooks, kindles etc, can I still download the books. As soon as I get all these auctions organized, I really want to support the books. The more kitties we can get spayed the better, no matter what country they are in. Let me know about the downloading. I am going to Barnes and Noble this week and look for your books. I'm not doing online purchases right now. I think you are doing a wonderful thing, feeding the six cats and working on getting them spayed and neutered. Thank you my furriend. Many sincere thanks for helping those innocents. Hey guys, you can check out the website now, you're in the sidebar and on the Rescue page! Good Human! I wish there were more like you.